Maternity dressing hasn’t always had the best reputation for style, comfort or support. But that all changed when best friends Valerie Darragh and Sabina Melarti founded Blanqi. Frustrated by the lack of stylish, supportive maternity wear when they were pregnant, the pair solved their problem by making their own. Now, the company makes supportive, seamless maternity leggings, tank tops and tees (that look seriously cool), from a patent-pending fabric that combines effortless moisture-wicking with butter-soft texture. Once you try a pair of Blanqi leggings, you’ll never go back. The Blanqi Pull-Down Postpartum and Nursing Support Tank Top is strategically designed to make breastfeeding easy, while giving your body maximum support. 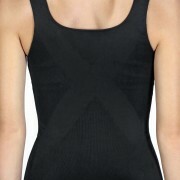 Bridging the gap between fashion and function, the world’s first high-performance, postpartum support tank. Pull down for easy breastfeeding with absolute stretch-and-recovery fabric. Highly technical, built-in support that smooths, secures and strategically targets your post-baby body’s challenge areas.